We started our day at about 6am in the morning for the Pratunam Morning Market. Good thing we didn’t have to travel far cos’ it’s just right outside our hotel! The most obvious landmark would be Indra Square and Baiyoke Sky Hotel. They sell a plethora of apparels and some street food. After which, you can continue at Pratunam Market, which opens daily where they sell even more apparels! I dare say, we stay near a shopping haven. Heh. After our breakfast and a quick nap, we headed off to MBK. There is nothing much there really, we went there just to get our intimates at their departmental store. It’s a lot cheaper in Thailand AND there’s tax refund. If you did your math, you’ll know it’s quite a steal! Directions: Ground floor, beside the Supermarket and diagonally opposite Four Seasons Restaurant. We were there at After You on our first day at about 8pm but was abashed by the long queue cos’ we haven’t made it to Siam Square yet for our shopping, so we dropped the idea and decided to come back again, if time permits. And WE DID! I’m glad we did because it tastes soooo…good you just want more! The queue was shorter when we were there in the afternoon. As recommended by the staff, we had Shibuya Honey Toast and Strawberry Cheesecake crushed ice. I LOVE THE SHIBUYA HONEY TOAST. Craving for it now as I type. They are pretty affordable at about 24SGD for both. They have a few outlets, but a pity I didn’t bring back their biz card to share the information here. From Siam, we departed to Asiatique. Directions from Siam BTS: Take the elevator up to line no.3 indicated on their signage, and take towards Bang Wa. Alight at Saphan Taksin. Exit and walk ahead, you’ll see South pier to take the shuttle boat. To note when returning: When returning from Saphan Taksin to your next location, take note of the train direction in which it’s headed, indicated on the train. They have only one rail track but with two different trains heading towards different directions. The shuttle boat only starts operating at 4pm to 11.30pm. Be there early. 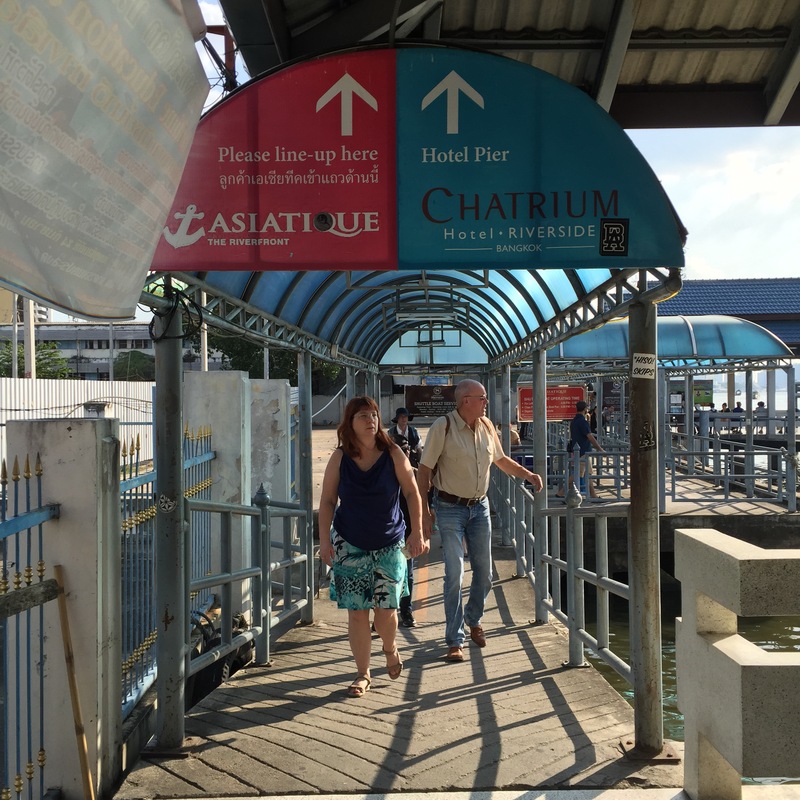 I arrived back at South Pier from Asiatique at about 5.30pm only to be greeted by a snake-like queue heading for the shuttle boat to Asiatique. They depart every 15 minutes interval, so I guess the queue won’t take too long. Asiatique is like Singapore’s Clarke Quay where there’s a lot of pubs/bars/restaurants. It’s crowded and happening at night, however, I didn’t manage to take in that atmosphere as my family were terribly spent from all the walking. They also sell souvenirs and some fashion apparels. Stay for the sunset if you must leave early. Absolutely breathtaking. We left for the hotel after, and bought KFC and street wanton mee outside our hotel to enjoy in the comfort of our rooms! Check out Day 1 here if you haven’t.